Michelle Obama is showing us the need for difficult and essential conversations about race. As our region counts down the days until Michelle Obama’s appearance Feb. 8 at the Tacoma Dome, I offer this wish: That our forever First Lady will teach Pacific Northwesteners how to gracefully abandon the spurious notion that America is past race, or that we are in a post-racial world. While the headline-grabbing topics on her instant best-seller, “Becoming,” include intimate details of her miscarriage, fertility treatment or couples counseling with Barack (President Obama to the rest of you), I am more fascinated by her frank disclosures on race, precisely because of the Obamas’ past performance as a post-racial poster family. Ralina L. Joseph will read from her new book, “Postracial Resistance: Black Women, Media, and the Uses of Strategic Ambiguity,” at 7 p.m. Feb. 12 at Seattle’s Central Public Library. In “Becoming,” and the press junket that has surrounded her book event, she models how to step into race, and how to bury the illusion of a post-racial society, where race and racism have been rendered irrelevant by the achievements of African Americans. 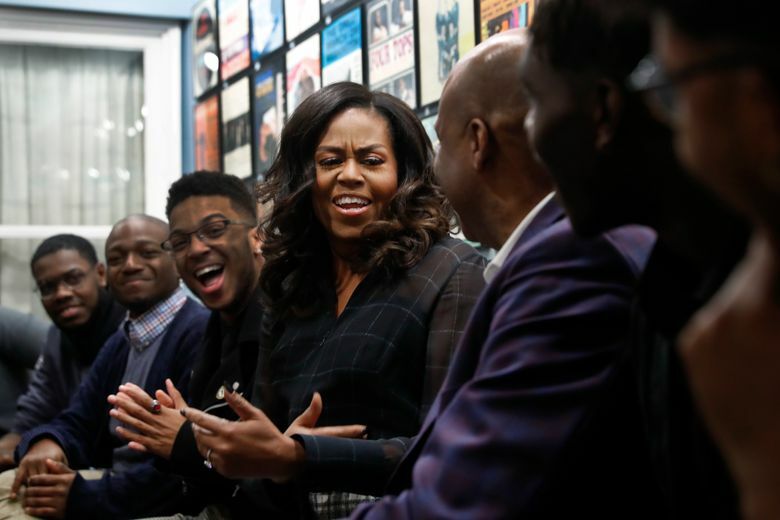 Race moves fluidly as the book traverses through Michelle Obama’s journey from her childhood home on Chicago’s Southside to the Ivy halls of Princeton, to the White House. Obama discusses code-switching, the survival strategy African Americans and other minoritized people use to speak two (or more) languages in order to safely access multiple spaces. The pressure to code switch, Obama recalls, sent her 10-year-old self into an existential crisis. She also writes of her suspicions about her white law firm co-workers’ over-the-top gushing over every “black man in a suit,” which this particular time happened to be a young summer associate named Barack Obama. Here she gleefully skewers the kind and gentle racism of various white benefactors who eventually underwrote Obama’s campaign. Obama forthrightly describes the racism that she experienced on the campaign trail, when she was called “Barack’s baby mama,” accused of not loving her country and told that she was angry. While her readers of color will nod their heads in recognition, Obama’s fluent post-White House race talk is shocking because of the way in which overt race talk was largely silenced during her husband’s presidency, providing the illusion of a post-racial White House. The first black president and his family seldom talked about race, for fear of unsettling white America. But, as Michelle Obama demonstrates in “Becoming,” not talking about race hasn’t unsettled white America any less. Her book illustrates how all Americans must part with the idea of post-racial society, the quaint notion that race and racism are relics of the United States’ long-ago past. This media-propagated fantasy, which lay dormant in the hopeful seeds planted in the Civil Rights movement, then sprouted in the “hope and change” Obama-era White House, now remains in the dandelion dust of entrenched Democratic politicians. Post-racial America, the fantasy co-constructed by liberal whites and a few moderate-to-conservative people of color, deemed that meritocracy had at long-last arrived, and interpersonal, structural, institutional and historical racism were in our rearview mirrors. To me, the Obamas’ silencing of race talk allowed their entry to the White House but sadly left racism intact. Flash-forward to our current administration where, continuing the gardening metaphor, racism has grown like a weed. In its policy and rhetoric, President Donald Trump’s administration does not feign pretense of any desire for equity, the idea that all Americans should receive access to the education, housing and health care all need to not only survive but thrive. In a similar way that the ethos of Obama-era, post-racialism hearkens back to the halcyon moments of fantasy civil rights, Trump-era racism hearkens to the voter-suppression tactics of so many decades past, continued through present elections. Had our country not so fully and foolishly invested in a post-racial fantasy, perhaps we would not be where we find ourselves. The silencing of race talk led to many dismissing Trump during the 2016 presidential campaign, ignoring his dog-whistle appeals, though his supporters and base voters heard the message all too clearly. Ralina L. Joseph is associate professor of communication and the founding and acting director of the Center for Communication, Difference, and Equity at the University of Washington.